Wednesday, October 31st: Books? You can’t eat a book! Today is BOOKS FOR TREATS DAY. Sponsored by Books for Treats (www.booksfortreats.org), this non-profit encourages distributing gently read children’s books instead of candy for Halloween. Books for Treats web site states, “Why give children books instead of candy at Halloween? 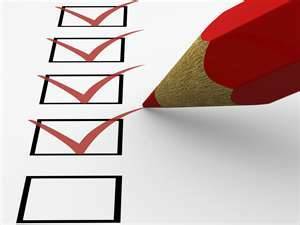 Tuesday, October 30th: Lists, lists and more lists; where would our lives be without them? Today is CHECKLIST DAY. What a strange day to celebrate, although I think I’m the queen of lists. My whole planner is filled with lists, so a day celebrating checklists caught my attention. According to www.checklist.com, “On October 30, 1935, a Model 299 prototype for the Boeing B-17 Flying Fortress crashed during takeoff at Wright Field in Dayton, Ohio. The cause of the crash was identified as a gust lock that was still engaged. I feel certain people were making lists before that, because even Santa has a list and is checking it twice. I’m not in charge of any aircraft, but I’ll keep making my lists to keep my life in order. And, I’ll celebrate any chance I get, so … Happy Checklist Day! Friday, October 26th: It’s a freaky kind of Friday. Celebrate FRANKENSTEIN FRIDAY today! Celebrated annually the last Friday in October, the day honors Frankenstein, a Halloween favorite. Although the day was created by Ron MacCloskey in 1997, Frankenstein has been around a lot longer. He was born in 1818 when Mary Wollenstonecraft Shelley, a mere 21 years old, wrote the story of Frankenstein. The movies in 1910 and 1931 propelled this green gigantic creation into popularity that continues today. Celebrate life, even when it’s celebrating odd green creatures. Sunday, October 21st: Today is a mind boggling kind of day. Today is the third CELEBRATION OF THE MIND DAY. 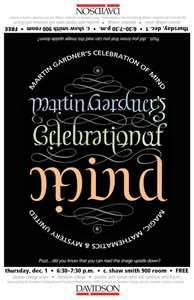 Today honors the life of Martin Gardner who would have been 98 years old today. He passed away May 22, 2010 and wanted no memorials, but wished that his work with Gatherings For Gardner (G4G) continue. Martin’s life was dedicated to the pursuit of a playful and fun approach to Mathematics, Science, Art, Magic, Puzzles and the workings of the mind. Celebrate a life lived fully; celebrate the magnificent power of our own minds. Grab a puzzle, exercise those gray cells, and appreciate the intricate inner workings of our own thought processes. Saturday, October 20th: Whoa … whoa … STOP! Today is INFORMATION OVERLOAD DAY. Computers were supposed to make our lives easier. And they have, in many ways. But in others … the information just keeps coming and coming, faster and faster. Jonathan Spira, author of Overload! How Too Much Information is Hazardous to Your Organization started the celebration of this unique day. He urges people to send 10% fewer e-mail messages. He states that “the average knowledge worker receives 93 e-mail messages per day and many are unnecessary. If every knowledge worker in the U.S. were to send 10% fewer messages, the cost of Information Overload would be reduced by as much as $180 billion per year.” And that’s just at work. Then, we arrive home and have a deluge of emails to reckon with, not to mention checking our Facebook, Twitters, Linked In, Pinterest (and a slew of other social networking sites, not to mention the blogs we subscribe to) and soon the nights over and we haven’t accomplished a thing. 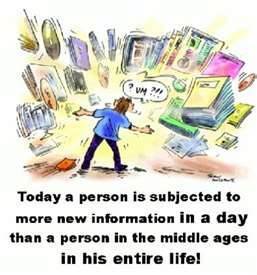 A minimum of 28 billion hours is lost each year to Information Overload in the United States. Reading and processing just 100 e-mail messages can occupy over half of a worker’s day. It takes five minutes to get back on track after a 30 second interruption. For every 100 people who are unnecessarily copied on an e-mail, eight hours are lost. 58 percent of government workers spend half the workday filing, deleting, or sorting information, at an annual cost of almost $31 billion dollars. 66 percent of knowledge workers feel they don’t have enough time to get all of their work done. 94 percent of those surveyed have felt overwhelmed by information at some point to the point of incapacitation. I had to reblog this beautiful, inspiring post. What a way to celebrate life and appreciate the abundance we have! I was never very keen on grocery shopping; it has to be done so I do it but not really enjoying it. Then I stumbled across a chapter in the book called “Life is huge” from Susan Jeffers and it changed my supermarket shopping experience totally. I actually enjoy it now, I am happy to do it and I am grateful that I can do it. Friday, October 19th: A woman scaling mountains; Happy Birthday Annie Peck! 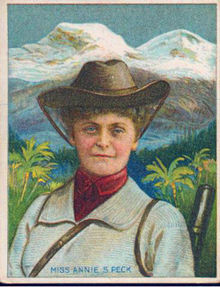 Born October 19, 1850, Annie Smith Peck discovered she had a passion for climbing mountains. She scaled several moderate-sized mountains in Europe and in the United States, including Mount Shasta. In 1895, she climbed the Matterhorn and suddenly became quite well known. Annie continued climbing mountains well into her sixties. She was an explorer, a woman who followed her dreams, a woman who celebrated life. Thinking of you today Annie Peck! Thursday, October 18th: Have fun. 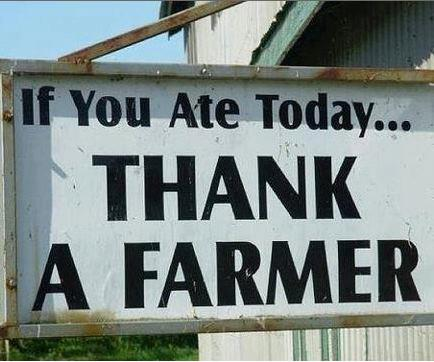 Eat with your family! October is NATIONAL EAT BETTER, EAT TOGETHER MONTH. It is time for adults to eat meals with children and teenagers and to celebrate family meals. Washington State University’s Nutrition Education Department sponsors this month of delightful eating together. They state: “Although nutritious food is important, children and teenagers report that what they like about family meals is the mealtime conversation. They like having time to share, find out what others have been doing, and to laugh. Wednesday, October 17th: Can I have a “do-over”? Today is MULLIGAN DAY, a day for giving yourself, or another, a second chance. “In golf, a mulligan is a stroke that is replayed from the spot of the previous stroke without penalty, due to an errant shot made on the previous stroke” according to Wikipedia. Several versions if the story of how a mulligan got its name exists. 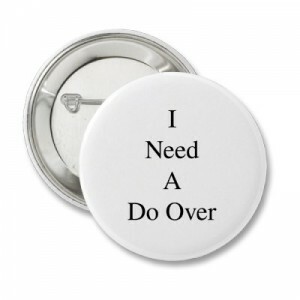 I guess it doesn’t matter which is the correct version, I’ll take a “do-over” anytime! Tuesday, October 16th: Words, words, words; celebrate DICTIONARY DAY. Today honors Noah Webster on his birthday, father of the American dictionary. He encouraged every person to acquire at least one dictionary – and to use them regularly. In today’s cyber-world, paper dictionaries may be a thing of the past. But, they’re just as useful as ever, be it paper or virtual. Celebrate the day by playing some world games. Here’s a link with a baker’s dozen on-line word games, including Crossword Cove, Hangman, Word Kingdome, Cryptogram, Clockwords and more. Pick a word, any word, and play the night away!